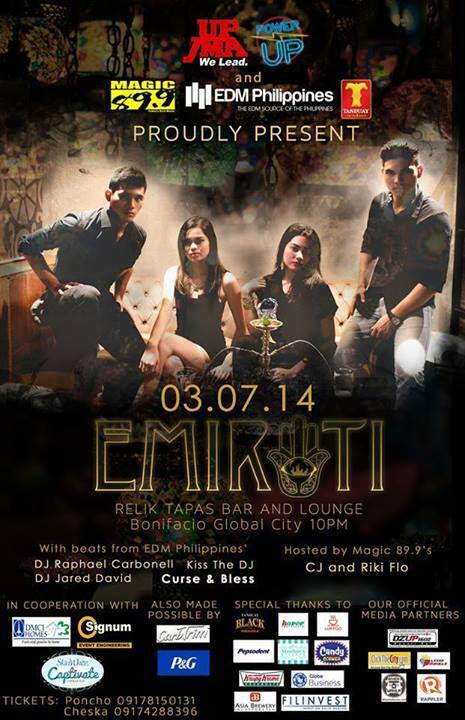 “EMIRATI” – 03.07.14 – Relik Tapas Bar and Lounge, Bonifacio Global City – 10pm – DJ JVC | DJ for hire in Philippines | DJ Mixtapes, Clubbing and Music Festivals in Manila, Philippines. UP JMA and Power Up together with: Magic 89.9 | Tanduay Rhum official | EDM Philippines presents the first event for March. Embark on an epic adventure and find yourself in a whole new world with free-flowing drinks, shishas, and beats from EDM Philippines’ DJ Raphael Carbonell, DJ Jared David, Kiss The DJ and Curse and Bless. All proceeds will go to Kids Integrated Development Through Schooling (KIDS) Program and the UP JMA Scholarship Fund.